All items will be sold "As-is, Where-is" without any warranties, express or implied. Although obtained from sources deemed reliable, the Auctioneer makes no warranty or guarantee to the accuracy of the information herein contained. Bidders are encouraged to thoroughly inspect the items on which they intend to bid prior to sale. Absolutely no items will be removed until the day after the conclusion of the sale and payment is made in full. All bidders residing outside of the United States or Canada are required to submit via wire transfer a qualifying deposit of 25% of their total expected purchases. Deposit instructions will be emailed upon registration. 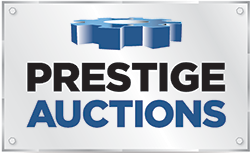 Deposit must be received and confirmed prior to start of auction, and can take up to 72 hours to clear. Please register at least 3 business days prior to sale to allow sufficient time to process deposit. Invoices will be emailed to buyers shortly after the auction closes. Only wire transfer or certified check payable to Hilco Industrial will be accepted. Company checks payable to Hilco Industrial will be accepted only if accompanied by a bank letter of guarantee.